Today I am pleased to have the opportunity to share the prologue and first chapter of External Forces, by Deborah Rix. Last month I posted a 4 star review of the book. Since then I’ve been talking with the author about her research, her publishing experience, publicity, and life in general. One of the things I love about reviewing books is that sometimes I stumble upon a work that I really believe in–and I can help to share it with the world. If the chapter reveal piques your interest, keep watching the blog for a follow-up interview with the author, and information about a giveaway. 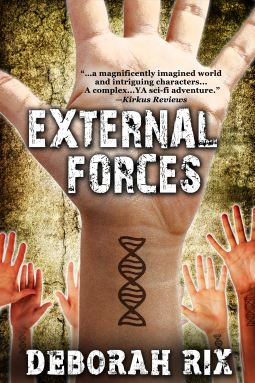 Today’s book review is for External Forces, by Deborah Rix, published by Dime Store Books. I received an electronic copy of this book through NetGalley in exchange for an honest review. External Forces is the first installment in the new teen dystopian science fiction series “The Laws of Motion.” It’s been 100 years since the United States passed the Genetic Integrity Act and closed its borders. Genetic deviants now roam outside the borders, but within the Department of Evolution guides the creation of each generation. So when 16-year-old Jess Grant discovers that she is starting to display signs of deviation, she decides to enlist in the Special Forces with her best friend, Jay, to avoid detection. Although Jess is amazing with data, she’s got lousy combat skills, so she’s surprised to be recruited to Black Ops by handsome Sargeant Matt Anderson. Resolved to discover why, Jess builds friendships, unravels mysteries, develops a romance, faces betrayal, and questions everything she’s been taught–all while struggling to hide the frightening changes taking place within her own body. Rix has crafted a truly gripping tale. The first night that I started reading, I stayed up far beyond my usual bedtime telling myself that I’d sleep as soon as I finished “one more page,” “the end of this chapter,” “once I see what happens with x.” That, I suppose, is what is meant when people say that a book was a real page turner. First, let’s look at the world building here. When I’m reading a story set in a dystopian future, it’s important that that future be plausible. After all, what gives these types of stories power isn’t absurdity, but rather that you can believe them. Rix wrote a future that I could easily envision as a reality. As each new element was introduced, I was able to connect it to current world events and track the path from point A to B. Economic collapse, influenza pandemics, crop failures, natural disasters–she draws upon the anxieties that currently plague us to build a bleak future. The choice to tell this story from the point of view of 16-year-old Jess is perfect. Jess is someone who has been a part of this society since birth, so she can offer the perspective of an insider. Yet, at the same time, she is an outsider like the audience–genetically impure and on the brink of discovering what the world is like underneath the propaganda. I like Jess. She’s so human. For all of her unique powers and abilities, she’s still insecure, doubtful, irrational, short-sighted, clumsy, and distrustful. Which brings me to the romance subplot… it’s the one aspect of the book that I just can’t make up my mind about. At times I found it really irritating. Other times, I found it perfectly reasonable that a teenage girl would spend so much time obsessing over a boy. Ultimately, I think that it wouldn’t have bothered me so much if the romance element hadn’t taken up so much space in the story. There was a lot of fluff in there that didn’t really add much to the plot or to character development. Still, Rix does do an excellent job at populating her world with a diverse cast of developed characters. She’s got plenty of strong women who can hold their own, whether they’re snipers, pilots, medics, or politicians. Jess’s best friend is gay. There are characters with roots in ethnic minority communities. There’s no doubt that this book passes the Bechdel test–sure, sometimes the female characters talk to each other about men; they also talk about shooting guns, data retrieval, science, treason and prophecy. Nearly all of the characters acted in ways contrary to my expectations at one point or another. And I liked that. Because it made them feel more human and less like stock characters. I’m particularly glad that this is just the first book in a series, because the narrative ended rather abruptly. Of course, I expected that there would be plenty of unanswered questions to set the stage for the second volume. It’s just that when I thought I had come to the end of the penultimate chapter, I discovered that I had actually come to the end of the book. (The fact that I didn’t expect quite so much end matter might have influenced this impression, since I saw that I still had several pages left in the book). Since then, I’ve revisited the ending and decided that it’s not as bad as I thought it was on first impression–but for many readers, that first impression is the only impression. On the positive, it certainly leaves you hungry for more. Great books manage to entertain us, while simultaneously challenging us. In this debut novel, Rix dislays her capacity to do both. External Forces is a complex and intriguing read for teen readers. There are some graphic depictions of violence, so I recommend it for mature readers. I’m giving it 4 out of 5 stars, and won’t be at all surprised if her second volume earns full marks. Rix has raised the bar for YA indie authors.